Confession #1: I feel like I am on vacation and could be happy this way for a very, very, very long time. How do people live near a body of water and a beach and make it to work in June/July/August? I hope they have a self-help book on this because I am counting down the days of freedom and soaking up every last second. Come July 9th, I may be in a deep depression…or on the beach. Confession #2: I like kale. You heard this last week and you’re hearing it again this week. This nutrient-packed, in-season veggie is beyond delicious. 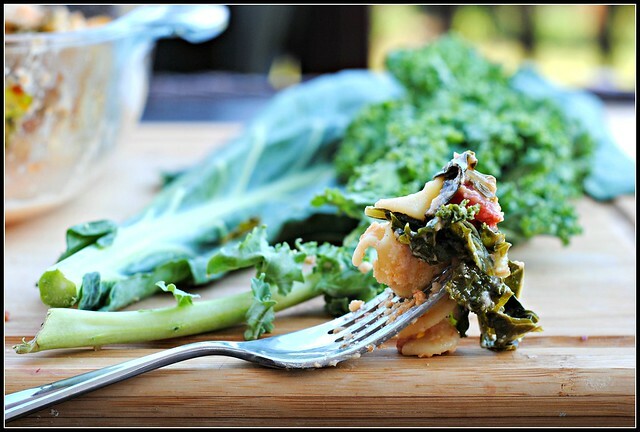 If your only experience with kale is in the way of kale chips, you’ve been missing out. Kale chips are a far cry from the potential that is kale. And, I like collard greens, too. Oh yeah. Yes, I just admitted that. If you say you love kale more than cheese, I call you a LIAR. Or lactose-intollerant. But, kale + cheese. Add some pasta. Now we’re talkin’. As I was over-filling this large skillet with my twelve ounces of kale and collard greens, I was truly skeptical. This was far too much green and far too much nutrition to be helped by any amount of pasta, cheese, or other delicious ingredient. Low and behold, I was wrong. And unlike Mr. Prevention, I love when this happens. I am more than happy to be wrong…so long as it benefits me. Because I had a very rough idea of what 3/4ths of a pound of greens looked like, I made this recipe on a night he was out of town. Little did I know, he was happy to reheat and inhale the leftovers without mention of anything green. There was only how this dish was good, while heading back for seconds. It’s OFFICIALLY safe to say that I’m a kale covert. And for the first time, I’ve cooked with collard greens. Which, for the record, are a bit easier to handle than the full-bodied kale. Could I tell the difference between the two? Nah. Not after being cooked and thrown in a dish like this. But it’s fair to say that this pasta meal would be great with most any green you come across or that lands in your CSA basket. 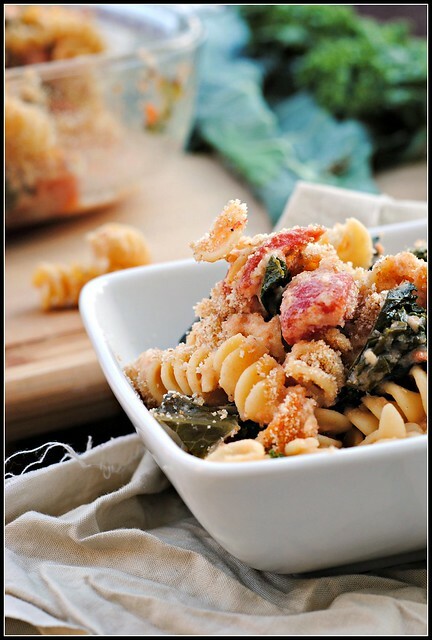 Pasta, cheese, and greens. It’s a perfect combination. Meanwhile, heat 1 tbsp of the olive oil over medium heat in a large skillet. Add the garlic. Cook 30 seconds, or until fragrant. Add the tomatoes, sugar, balsamic vinegar, salt and basil to the pan. Stir, turn up the heat, and bring to a boil. Reduce heat and simmer for 15-20 minutes or until thick and fragrant. Add freshly black pepper. Stir in the goat cheese and parmesan cheese. When the water for the pasta starts to boil, add the pasta and cook for 7-8 minutes. To the boiling pasta, add the mixed greens and cook until softened, about 2 minutes. Drain and transfer to a large bowl. Add the tomato-goat cheese sauce to the bowl and combine thoroughly. Transfer to an 8×8-inch baking pan or a 2 qt baking dish. Toss the breadcrumbs with the remaining tablespoon olive oil. Sprinkle over the top of the pasta. Bake until casserole is bubbly and breadcrumbs are lightly brown, about 30 minutes. Let stand 5-10 minutes before serving. Result: The perfect marriage of pasta, veggies, and cheese. 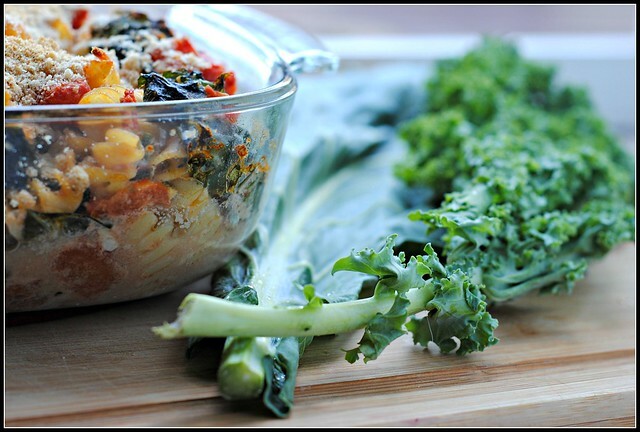 This baked pasta is not short on flavor, or nutrition. If you’re attempting to add new veggies into the mix, pasta is the perfect disguise. 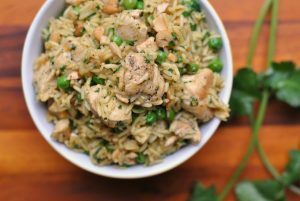 Simple to make, reheats great, and absolutely delicious! Enjoy! No major plans today…but they start on our hard wood floor installation! I do believe Mr. Prevention has a LONG list of to-do’s that doesn’t seem to be getting any shorter (painting, power washing, sealing the driveway, caulking, etc.). But task #1: ridding of the moles in our front lawn! With the moisture of the lake, they apparently love it here and they will slowly destroy our lawn if we don’t shoo them away now. Other than that, I discovered a BEAUTIFUL running trail that connects to our road and I plan to take full advantage! I’m glad you’re enjoying the new area! Too funny. Hubby was out all day trying to spray and do grub treatment. We shall see if it worked! Kale is my favorite vegetable. I can eat heads at a time. Yum. This sounds awesome! If we get some kale in our next CSA delivery, I’ll have to try this! I love living by the beach, and in the summer I spend as much time there as I can. The whole beach and mountains in the same place thing is exactly why I would never want to live anywhere else. I couldn’t give up either. My SIL is back from vacation, so I may have to put this on our lunch menu for next week – you are slowly convincing me to try kale again! Have fun on your run! This looks amazing! Saving this recipe for sure. I have to say I am the one that has only had kale in the form of chips. Really need to try this. Sooo when you see my post next week it will be clear we share a brain 😉 Just a heads up! I loooove kale and can go through entire big bags of it on my own – yup, that’s right, I make it easy by buying the bags of pre-chopped, washed stuff! SO cheap too. I love kale! But I love all greens. 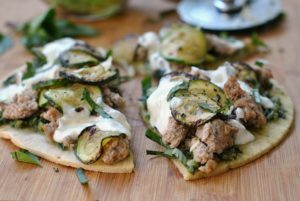 I just wanted to leave a comment letting you know how amazing all of your recipes are! Everytime you post I get so excited because the food looks so mouthwatering and you’re hilarious too! This looks fabulous. 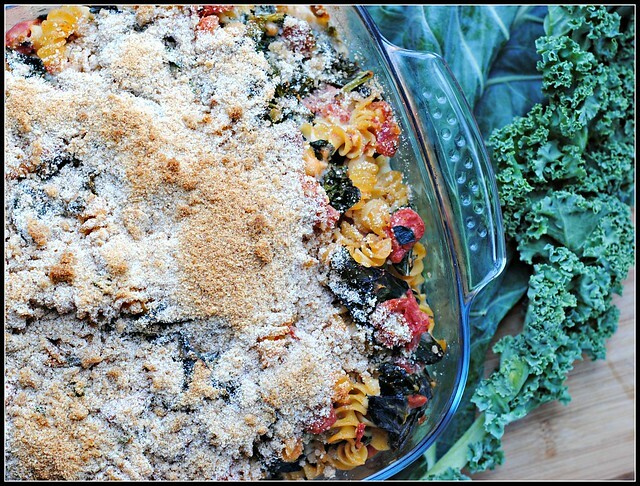 Goat cheese, kale, and pasta? Hello! I love all your meatless Monday posts. I wish so badly that my family didn’t love meat! Lovely! 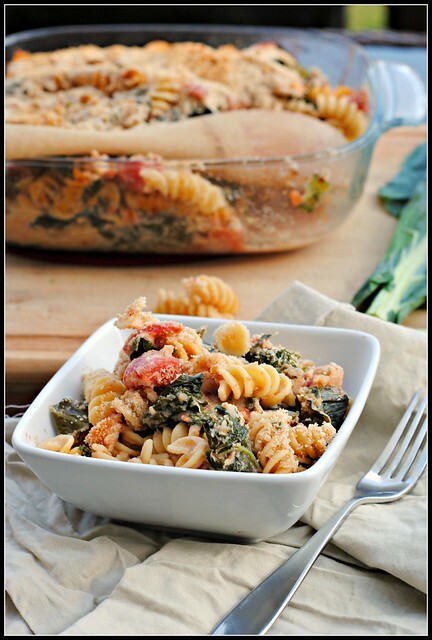 I recently made a similar pasta bake to this, but with spinach and blue cheese instead of kale and goats’ cheese. I think I’m gonna make this for dinner tonight! Just made this for dinner and it was phenomenal! Flavor was outstanding and the added nutritional punch from the kale was perfect. My picky 3 year old loved it, so it’s a win in my book! Thanks for all of your amazing, nutritionally balanced recipes, you’ve made dinner time much easier in my house! Made this for supper tonight. Delicious! Great flavor. I will have to add kale to more dishes now that I know I like it! Thank you for the great recipe.